New. 1984884360 Brand New! No Remainder Marks or Worn Dirty Overstocks! What a powerful book about the power of an introvert in a world that can't stop talking!! My sister sent me the info with a note that said: They have finally written a book about me." I have sent it to others who have basically said the same thing. A great read! Perhaps when you have been with a group of extroverts for a day, or several days, you simply have to get OUT. You need to be alone. You need to think about your own thoughts, and not need to share. That's a quick way to investigate your own mind. If that is how you feel you are an introvert. Otherwise you are an extrovert, needing others to share with, needing new ideas, needing things that just don't make any sense but let you laugh. There are other ways, and the book will dip much deeper, but the words above are a good start. I call this a five star. 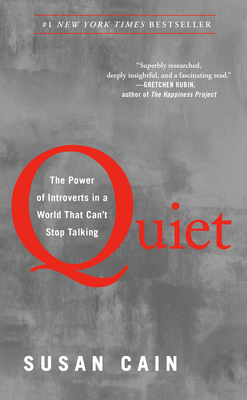 Great book for introverts and extraverts alike with much relevant information for all of us. Counters prevailing assumptions that the best course of action is always the one put forward first and loudest. Let's all listen to the quiet ones among us. This is an incredible book; totally validating for those of us who are introverts. Cain?s research is exhaustive and illustrated that this wasn?t some psychobabble by a new theorist. Cain takes the historical approach to ?how America turned into the land of the Extrovert.? In fact, business and industry has turned it into the ideal. After explaining the differences between the introvert and the extrovert in the light of the latest psychological and neuroscience research, Cain shows what the introvert brings to the table. Everyone in business doesn?t have to be an extrovert ? and Cain proves it through real-life examples. I feel the strongest part of the book is the light she places on introverted children and how to help them accept their differences, help them strategize their difficulties (classrooms are mostly set up for group activities; this constant togetherness is hard on introverted children) and become successful people. Cain also spends time with parents, helping them understand how they can help their introverted children to shine. She gives examples of extroverted parents with introverted children and extroverted children with introverted parents. I only wish this book were around when I was a kid; my aunt constantly took my book away and made me ?go out and have fun.? I feel that Cain?s message is uplifting: Even though Americans are mostly extroverts, introverts can make their mark by accepting their unique gifts and giving themselves the quiet time they need to think. This was one very fascinating book, particularly the first half. Finally an explanation for "white coat syndrome" and other anomalies that have plaqued me throughout my life. The book also explores recent scientific evidence that working in groups is not necessarily the best way to solve problems--and open office plans are not the best way to maximize employee productivity. I'm looking for more books like this, where the science of introverts is written in a conversational manner.